Welcome to your home away from home! 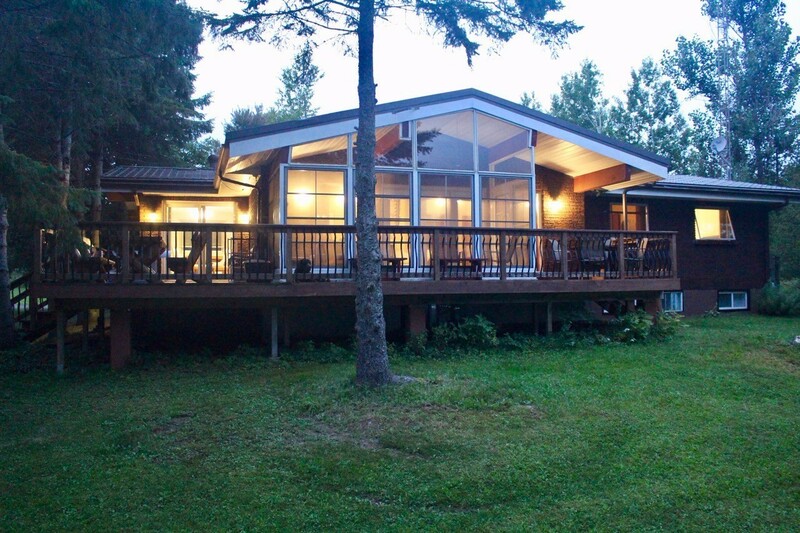 Wraight Escape is a spacious 4-season bungalow on a bay of Lake Manitouwabing - the largest inland lake in Parry Sound district. 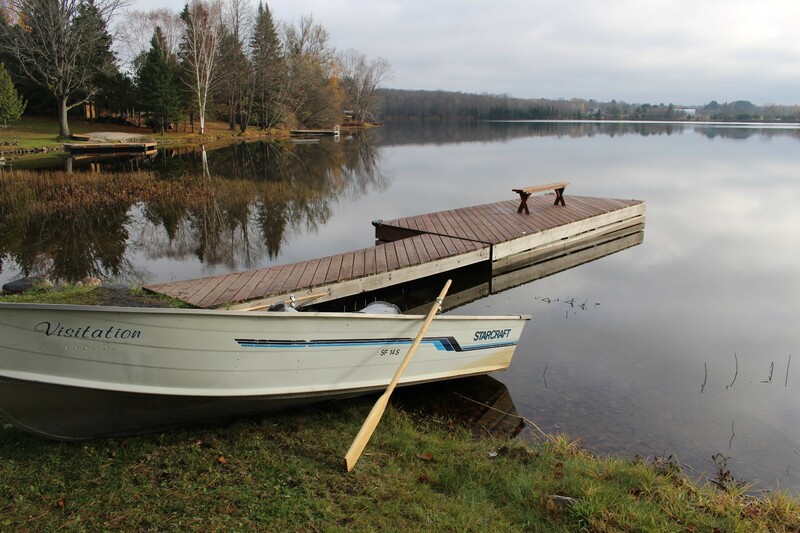 Lake Manitouwabing offers miles of boating, excellent fishing and snowmobiling too! 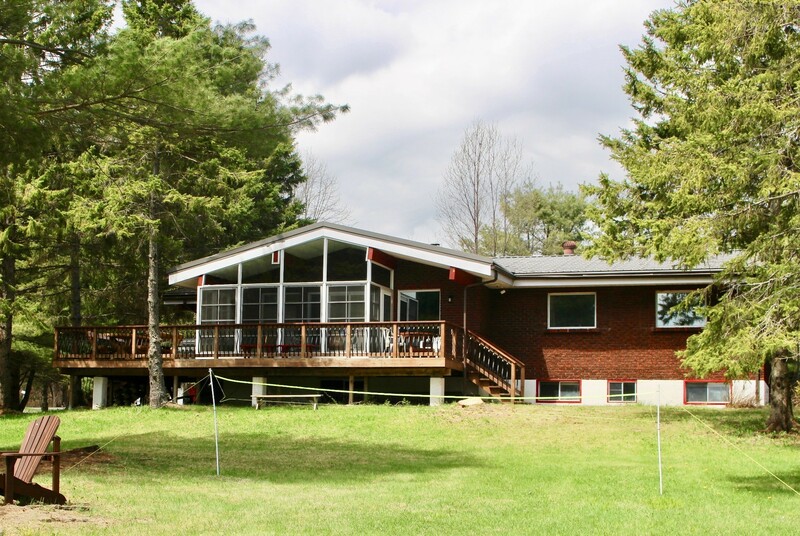 The cottage is found on an enjoyable large level lot, with an acre and a half of property to enjoy, gently sloping towards the refreshing lake with 92’ of water frontage with East exposure. It has a natural gradual water entry, perfect for kids. Our boathouse is stocked with many water toys for everyone to enjoy from the kids to the grandparents, we even include pool noodles! 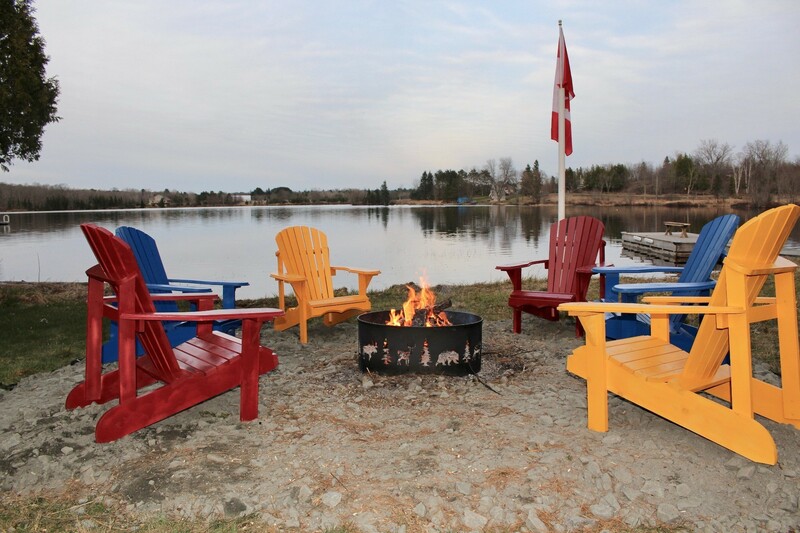 Steps away from the water edge, enjoy some s’mores by the fire relaxing in Muskoka chairs set around a decorative fire ring. 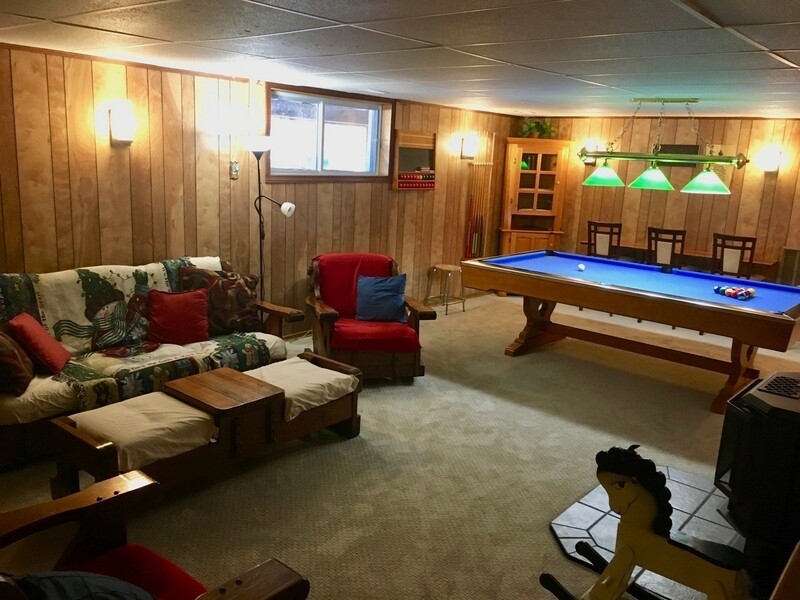 Inside you can cuddle up with a propane fireplace downstairs enjoying your favourite movie, or have fun playing a game of billiards, snooker or darts. There are a number of board games and cards, a Wii system and a foosball game to keep the gang entertained in the evenings. 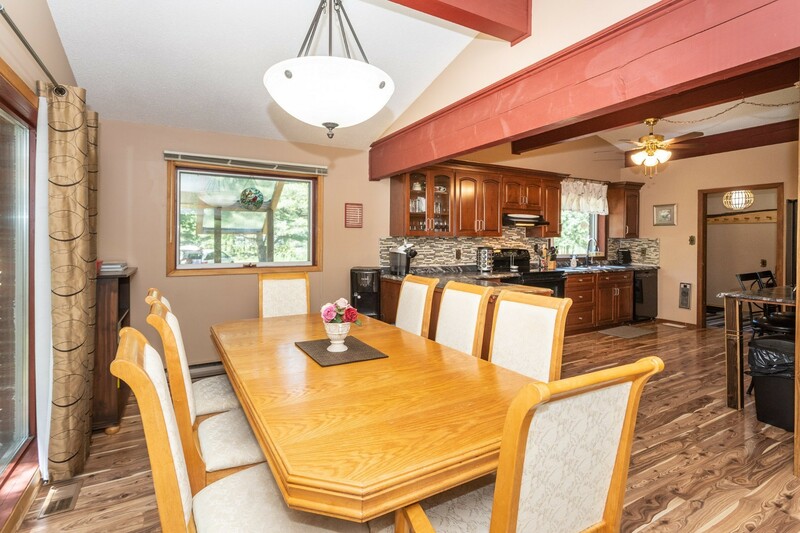 Cathedral ceilings in the kitchen and spacious family room, large windows to take in the view, a Muskoka room to enjoy cards bug-free! Enjoy a family gathering around a large oak dinning table or outside on a beautiful handmade log table set. 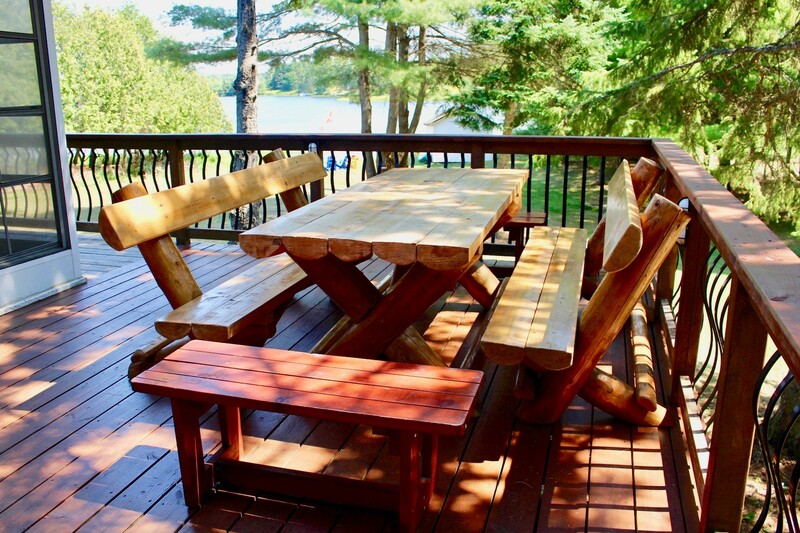 The deck is gated for the safety of little ones and your furry best friend. There are three bedrooms on the main floor, two on the lower level, and washrooms on each (Full bathroom up and half bathroom down). 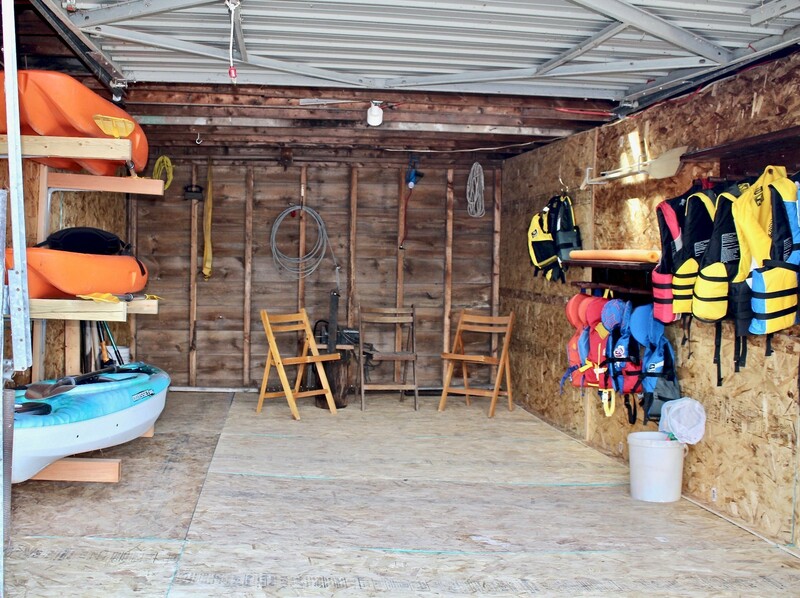 Upon request, the double car garage is available for safe storage of your ATV, Sea-Doo or snowmobile. Dogs are welcome at Wraight Escape! We stayed at the cottage for a second time, so we thought we would write our experiences in a rhyme. Lots of snowmobiling and lots of great games, even a fashion runway when we made up nicknames. Although one fell and broke her toes, she kept hopping around. Look, there she goes! Such a great cottage, we wish we could stay. But for now it's time to sashay away. Six friends ice fishing and snowmobiling. Not the best luck fishing. Snowmobile trails were great. Cottage was cozy and great games. Everyone enjoyed the stay at the cottage. The boys loved the pool table in the basement, the kids loved the bunk beds, and the dogs loved the surroundings of the cottage. A little piece of "paradise". We would love to come back in the summer. Thank you for providing the perfect space for us to make memories! Merry Christmas and a happy new year. We had a great time here. You have an amazing cottage to escape the city life. We look forward to coming back again in the future. Thanks and wishing you a wonderful new year ahead. Thank you so much, we enjoyed our time here. The two grandchildren, grandma and mother of the children enjoyed kayaking. We got to watch a female mallard for the longest time in her natural environment. Caught one pike which they ate. Second time out caught another which the children convinced their dad into releasing. Great way to teach kids about food connectivity. Loved playing pool. Bonfires were awesome. Beds comfortable. We had a very enjoyable, relaxing time inside a beautiful place to spend holiday time together as a family. We all enjoyed our stay at this cottage and especially the view of the lake. Three of us brought our own kayaks. We also used the paddle boat. We made meals together and enjoyed chatting around the dining room table. A great week of R & R! We had so much time together - it was fun fishing, paddling, playing and relaxing as a family. Thank you! Awesome week at Wraight Escape. Thanks for sharing your beautiful, well kept cottage with us! Water mat, kayaks, canoe, a row boat and a paddle boat! What could be more fun! The weather was great for lots of outdoor fun, and night time was filled with games, movies and lots of "junk" food. Everyone from Grandpa and Grandma to a two year old had so much fun. We had such a wonderful family time sharing your cottage. Thank you very much! Our grandson had such a fun time learning to kayak. We also learned we have a grandson coming this January - such a blessing! We look forward to coming back next year! A wonderful place for three generations of our family to spend a fun week together! Thank you for your hospitality. Feels like home here, very comfortable! Beautiful place, lots of toys inside and out! TV and internet were much appreciated! We all had a wonderful time. Thanks so much! This was the perfect place to bring our family. We had family visiting from Denmark (their 1st time to Canada). It was so nice we could all experience such a beautiful location, the kayaks, the paddle boat etc. and of course your beautiful cottage. A great weekend and we will definitely consider you for our next cottage rental! This was a great vacation in a beautiful winter wonderland. Over 3 fee of snow allowed us to build an igloo on the lake where the kids had a blast. This was a wonderful experience in a cozy and welcoming cottage. We hope to be back soon to experience other seasons and wonders this area has to offer. 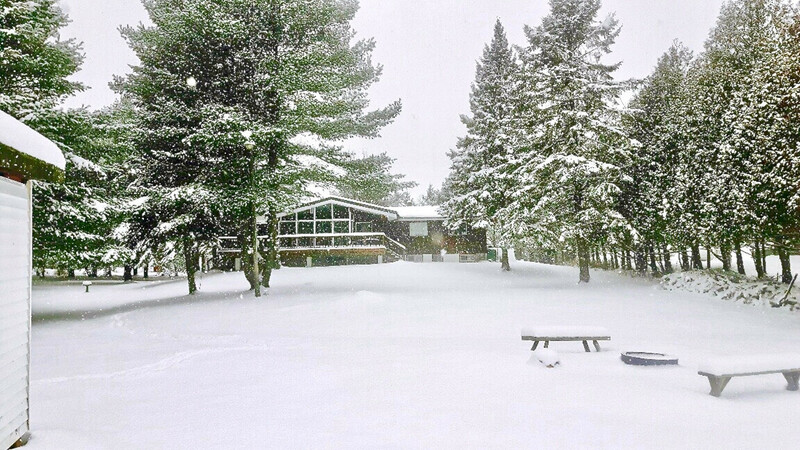 This was our first winter getaway at a cottage. Our family truly enjoyed our stay. We couldn't have asked for a more spacious and well equipped place. A lot of great memories were made, as our children's spouses got to experience our family's favourite winter past time, snowmobiling. We also got to relive some old memories while watching our granddaughter learn to ride her own snowmobile (as she would say, "it was just her size"). 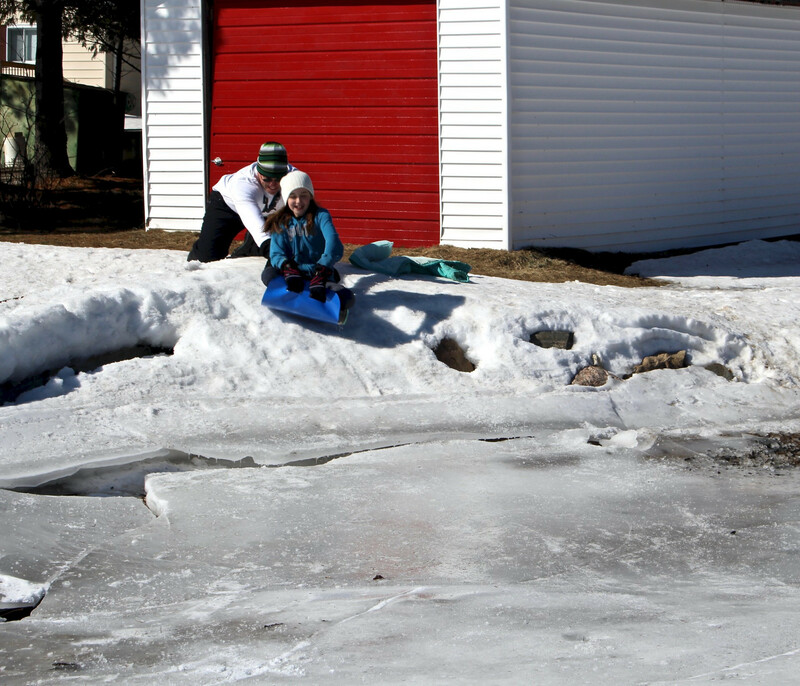 Our days were filled with movies, games, pool, darts, walks and tobogganing. I especially enjoyed the creativity that we all played a hand in prepping meals and later sitting down and reconnecting as a family. Overall the weather cooperated minus one little hiccup which caused a 12 hour blackout due to freezing rain. We hope to make this an annual tradition. Thank you for helping us build new memories! Had a lot of fun here! Snow and snow and more snow - unexpected but beautiful! Thank you for hosting us - we will have to return for a summer get away as well. Our week here was the best of my life...WE GOT ENGAGED <3 ... with beautiful views and what felt like such a home we were able to relax and really enjoy our time together as we start this new journey. We had a great Thanksgiving weekend at the cottage. Weather was spotty, but we enjoyed some beautiful sunsets. We went out on the water in the kayak, had a nice long walk and played tons of board games inside. Thank you for the lovely weekend! We had a great time. Loved the place and the lake! A yearly trip all the guys do and we were happy with everything. Fishing was exceptional and couldn't have asked for more. This has been a truly wonderful vacation. The sun shone every day. Your house is lovely. Thanks for enabling us to stay in such a beautiful, tranquil setting. We have mastered the kayak, canoe & pedal boat, something we had little, if any, experience with. We have enjoyed BBQ's and sitting around the campfire singing "ging gang goolay". It's been a relaxing and calming break for all. Thank you so much for sharing your beautiful cottage with us. So many amazing memories were made out on the beautiful lake. The kids loved their fishing adventures, solo kayaking "expeditions" & chill time in the paddle boat. You provided everything we needed for a very comfortable & enjoyable stay. Thank you for this & thank you for sharing your place so that we could make forever memories with our children. We had a fantastic week. Great weather, friends and memories made. This cottage has been well loved and the owners have though of everything!! We've rented many cottages over the years and this one has topped the list. Perfect for a multi family vacation! Thanks for the memories, we hope to be back! Our family had a wonderful vacation here at Wraight Escape. We really enjoyed the water "toys" and relaxing on the dock. The pool table and darts really helped pass the time on our rainy day. The kitchen was very well equipped and we loved having the Keurig! Our family thoroughly enjoyed ourselves. 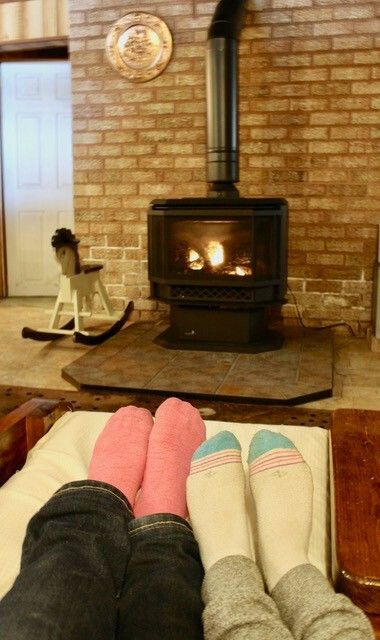 The cottage is very comfortable and wonderfully equipped. We had a few rainy days so the screened room and the pool table were much appreciated. Jen & Mike, thank you for having us at your amazing cottage. It was nice to wake up in the morning and sit in the screen porch with our books and tea! We had so much fun with the water toys! Water was nice and cool! At night we would have a fire and make s'mores and spider dogs! It was the perfect weather all week! We can't wait till next year to come back. We don't want to leave. It has been a great week. We all love the couch and chairs that look like people. The table was perfect for us! 9 yrs and 3 1/2 yrs, all enjoyed your cottage. The floating island was the best, we all had a ball on it. All the water equipment was great. Had wonderfully yummy BBQ's. Loved the outside picnic table. 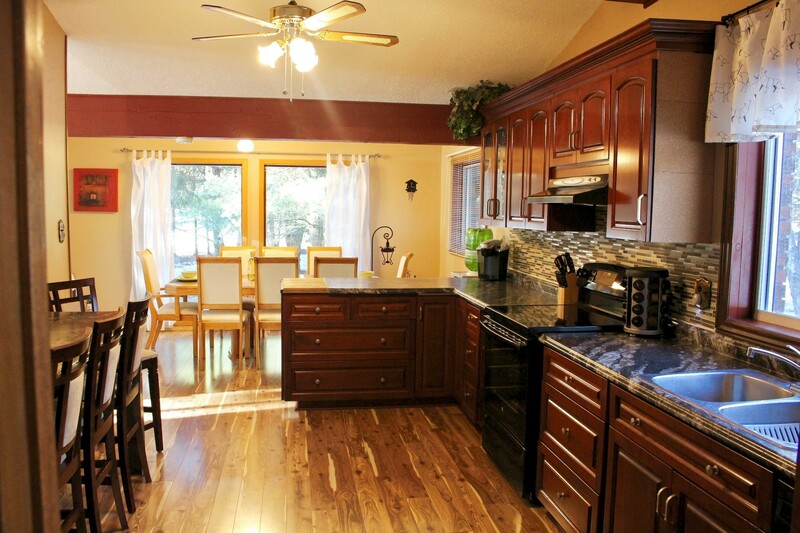 Tons of space, great large dining table, kids loved all the games & toys you have for them. Foosball & air hockey was a blast. Thanks for a wonderful time, we were so blessed to have my best friend from Lethbridge, Alberta join us on this vacation, she doesn't want to go home! Thanks for the gifts you left for us! Wraight Escape was the "Bomb". We had a wonderful week at your beautiful cottage. Thank you for letting us rent your cottage. The weather was spotty, but the cottage provided many wonderful surprises to fill in, while the weather had its way outside. The amenities were plentiful, just like the home. You have everything we could possibly want to prepare great meals. 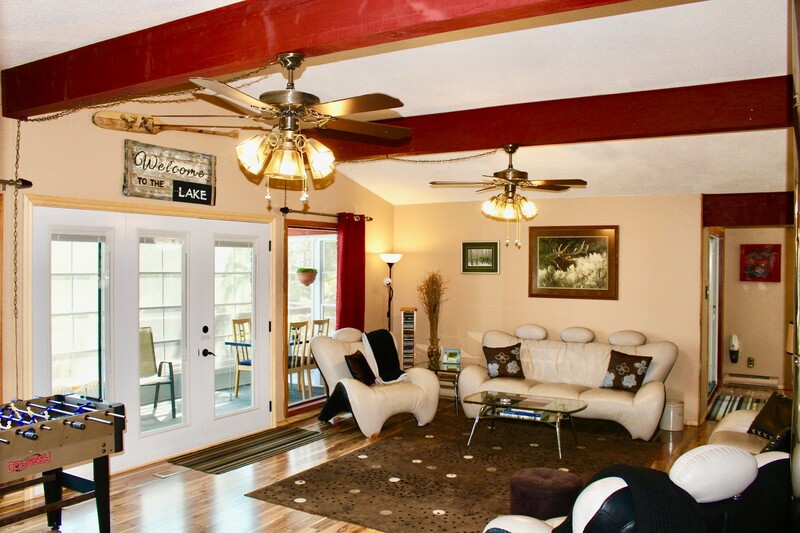 Dear Jen & Mike, thank you so much for letting is rent and enjoy your beautiful cottage. We were here with two other families, and we all (kids and adults) loved our stay at your well equipped, beautifully decorated, and well maintained cottage. This was our first time renting a cottage and the expectations have already been set very high. The weather remained gloomy for most of our stay but we were able to make most of the sunny breaks. Kids had great time inside and outside the house. Will surely come back again next year. Thank you for having this beautiful cottage for us to rent. We have rented many in the past & you have thought of every little detail! We just got married & came for a family trip with Parents, Grandparents & Grand kids. My children had a great time, loved the toys, movies, outdoor toys. My oldest Hudson (3 1/2) caught a bass that was 18 1/2 inches, he was thrilled! Nolan our one year old just started to walk and had a great time exploring the property! Daddy & Uncle Jay seen a big snapping turtle on the side road and everyone loved fishing on the lake! 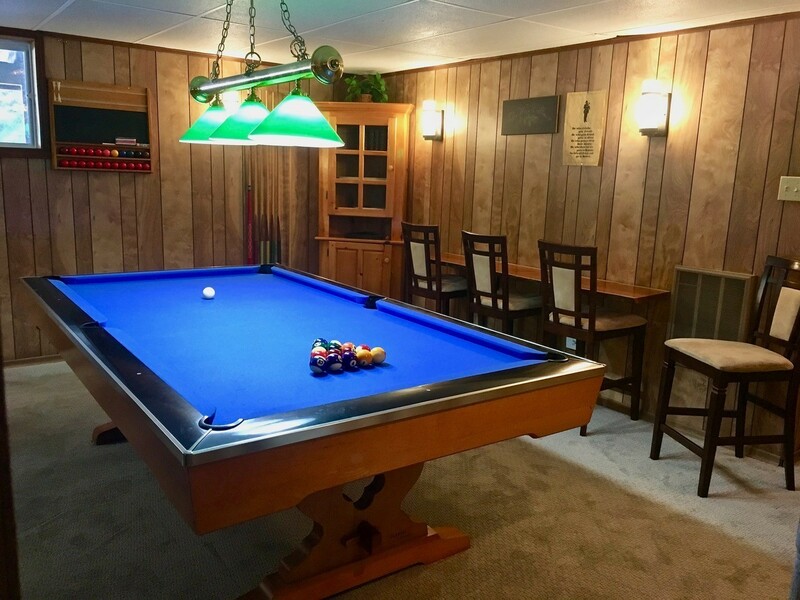 The men loved the pool table downstairs, it's such a nice place to hang out & relax! I couldn't say enough nice things about this place, thanks for the great memories, keep it up, Jen & Mike! Thank you for letting us come to this cottage. We had a great time and great fun such as fires with smores and going canoeing. We would like to thank you for letting us rent your cottage. We had a great time and love the cottage. Our kids enjoyed staying here, their top favourite was the bunk beds. They also enjoy the entertainments that were available. Thank you once again, hope to make another trip. Thank you for letting us rent your cottage. It was truly a wonderful stay. Everything at the cottage was just perfect! Our stay was beautiful. Thank you very much for letting us rent your cottage. We had a great weekend. We very much liked the stay as the cottage was beyond expectations. The only sad story was that our friend had to leave for emergency. We had a great time here, a very happy Christmas. This is a lovely place; you created an amazing atmosphere here. We are looking forward to coming here again in the future! My son is saying "This place is the best place I visited in my whole life." He wants us to stay here for ever. Definitely, we had enjoyed the place as it has the most activities we know that it can be in a cottage. We had never visited a place full of activities like this. Me and my friends are planning to come back for sure. We had a great week here, the view is awesome with the leaves changing. Everything we needed was provided and the kitchen was fully stocked. The cottage is lovely. Thank you again for another wonderful cottage experience for our family! Thank you so much for letting us use your cottage. You are so "sweet"! We are very happy to spend this weekend in a beautiful place, had lots of fun and enjoyed the comfort of the facility. We are very pleased to have chosen Wraight Escape for our short vacations. Everything was amazing!!! The cottage is beautiful and very well equipped. We enjoyed playing all the games, sports and water activities. We loved the peaceful boat trips, the spectacular fire under the stars at night, the fabulous BBQ dinner outside. We shared a delightful time with our friends, definitely lots of memorable moments that we will share with our friends and families. Our families had an amazing time at your cottage! You have thought of absolutely everything! We have rented many cottages before and yours is hands down the best! We enjoyed boating and caught some bass. The kids enjoyed frog catching too, and the kayaks and the water mat were a hit! 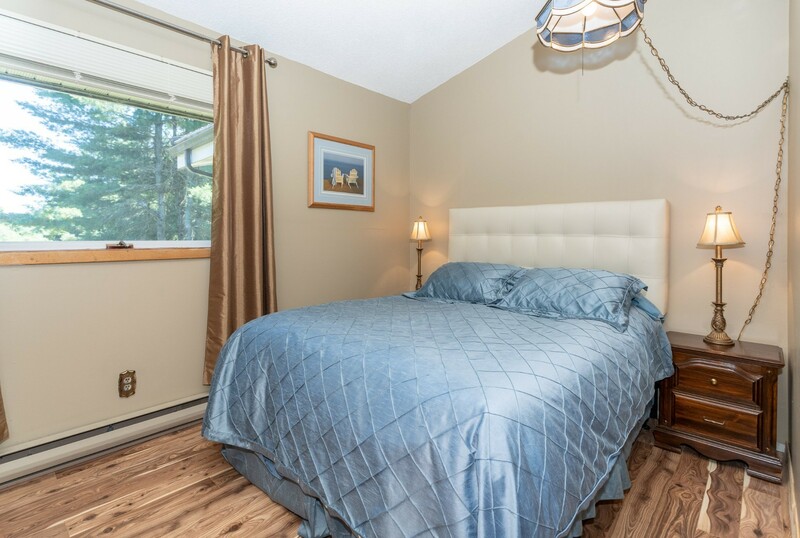 Our family has rented many cottages in the Muskoka and Haliburton area over the past 15 years and your lovely cottage is one of the best equipped of all of them, making for a very enjoyable vacation. It's great that we could bring our "grand dog" as well. Our 3yr old granddaughter loved experiencing her first campfire and roasting smores and the shallow water was perfect for her to float around with her water wings. We hope to have the opportunity to return next year! Thanks! 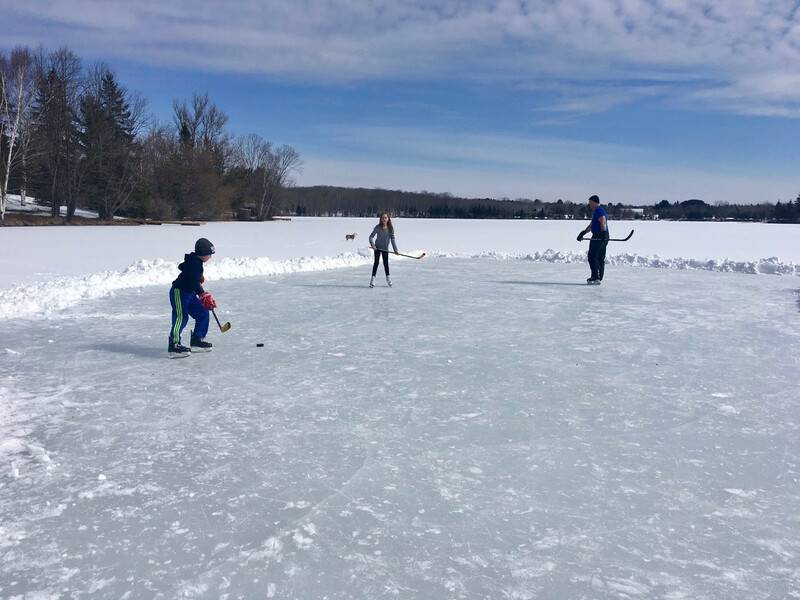 Having recently moved back to Ontario after 20+ years out west I was eager to share some of my favourite childhood memories with our children. We just spent an incredible week with my brothers and their children at your beautiful cottage on the lake that we ourselves grew up on. 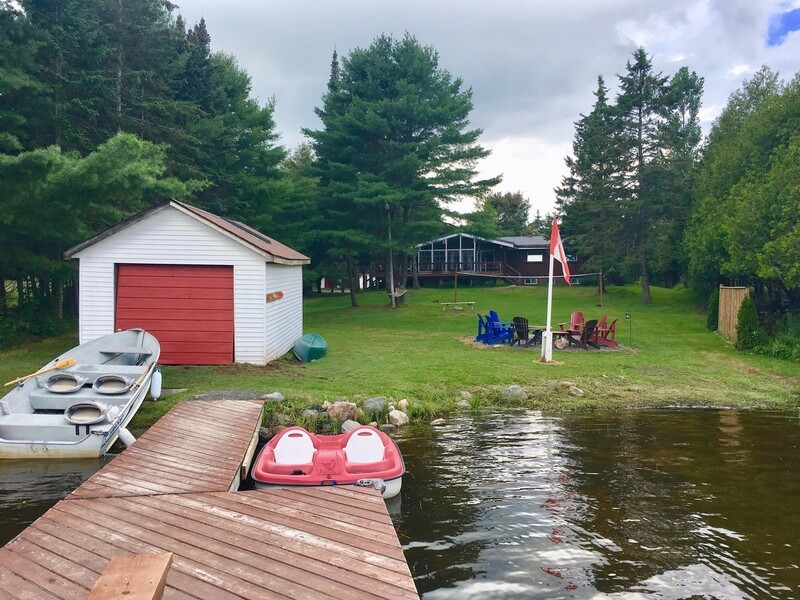 Our fondest childhood memories were made on Lake Manitouwabing in McKellar at our Grandparents' cottage - and now we were able to extend those fond memories to our children. Thank you for everything - we loved your cottage! What a great week! Foster parents of four wonderful teenage girls who enjoyed the week playing in the water. The water pad was a hit! Our son and his girlfriend, my sister and my husband all enjoyed your beautiful cottage as well. We shared many s'mores around the campfire. Beautiful starry nights. Thank you for the use of your lovely cottage. Many great memories were made. This was the owner's family week and we made many memories and a family tradition! We are so glad everyone is enjoying our cottage, we always look forward to reading the comments you leave for us. This week we did have family visit with us, did a few chores and had lots of fun! Our kids caught their first fish - 15 1/2" Bass and 13 1/2" and 14 1/2" Pickerel plus many too small. We had a deer pop out in front of our truck on a trip to town. We learned first-hand how easily watercraft can disappear from shore! 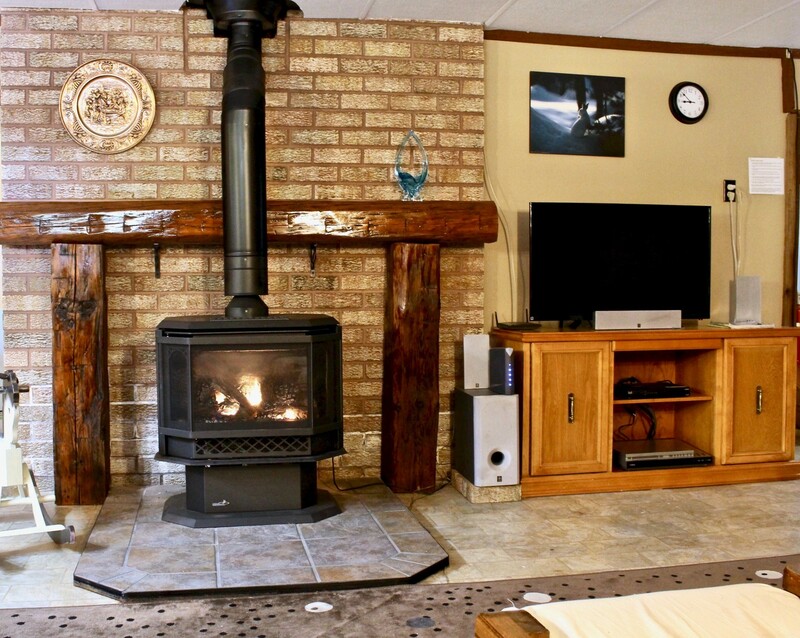 We had a propane fireplace installed for cozying up on those chilly days, stained the decks and cleaned the water weeds. We have had a wonderful stay at your beautiful cottage. Our group consisted of 9 people and included 2 sets of parents and 3 children 3 and under. We found your facilities were perfect for everyone. We spent hours in the lake using the floating mat and canoe. We were very fortunate and had amazing weather all week, so we spent all of our days outside and didn't have the opportunity to take advantage of all of your "indoor" activities. We were very impressed with everything we saw though. 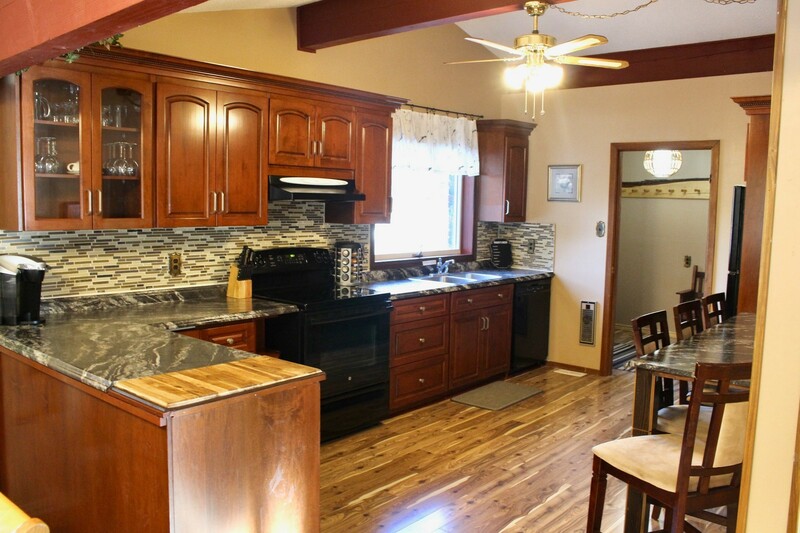 We were also impressed with how well equipped your kitchen was. All in all, we had a fabulous family vacation and would highly recommend Wraight Escape!!! This was the Wright Escape for us! We had a wonderful time and the week sadly flew by. The water mat was a huge success with our 3 boys. Every day was spent at the dock cooling off with a quick dip. Our kids learned to kayak this trip and we all followed the shoreline for ice cream at the Marina. A perfect trip on a hot summer day. The cottage is well stocked for entertainment: darts, pool, DVD's and movies. This was again, a wonderful week. Thank you. We created many memories. We will miss the night sky and will think of it on our return home. Thank you for allowing us to rent your lovely cottage. Our children and grandchildren had a great time. We (the parents and grandparents) had a relaxing time enjoying the beautiful scenery: the lake, the trees, the animals, the sunsets, moon and stars. A perfect place to meditate on God's wonderful creation. Thanks too for the wonderful neighbours who came to our rescue when the water mat blew away on the lake!! One minute the lake is calm but suddenly the winds come. We enjoyed every minute of our stay; always too short. Thank you for a great family vacation! Your property is beautiful and we had the Best time! Perfect location and setting! Hope to be back next year! Thank you for an amazing stay! We had a blast at the Wraight Escape. Your property is perfect to make great memories with friends. The water is warm, the view is serene, and the house is so inviting. We'll definitely plan another trip up here next year! We would like to thank you so much for letting us rent your beautiful cottage this weekend. It was beyond what we could have expected. 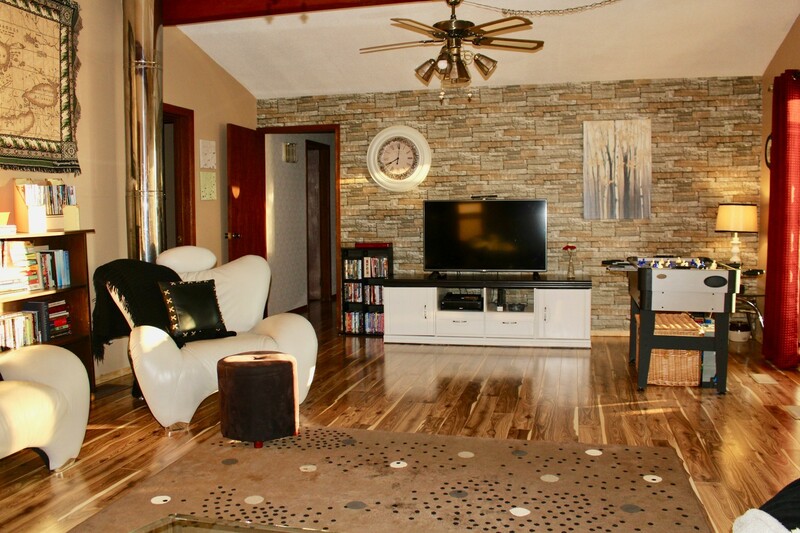 You have done an amazing job renovating this property and we would love to rent again next summer. Thanks again for everything. We usually rent a cottage during the summer and this is by far the best and most relaxing one we have stayed in so far! 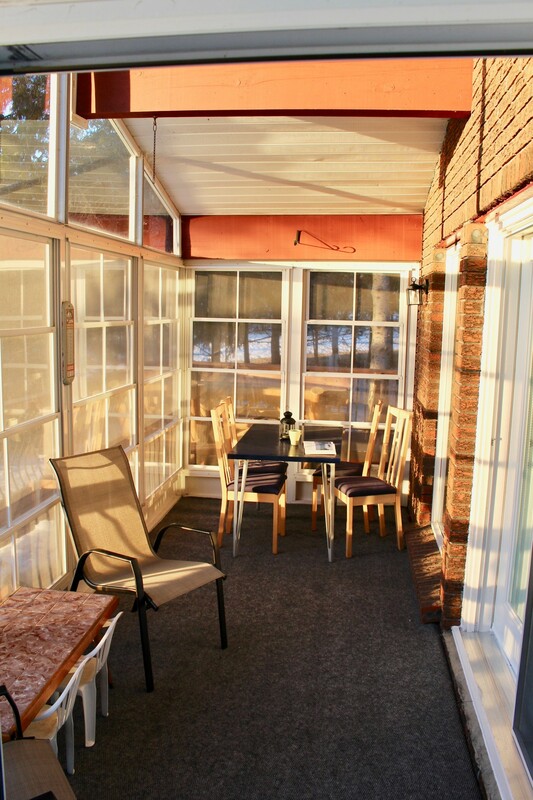 It had a great view of the lake from the living room and you have access to a wrap-around balcony which had an outdoor dining set where you can have breakfast/brunch and bask in the sun! We usually pack a lot of things/items with us but we did not have to do that since Wraight cottage had everything we needed (i.e. towels, cleaning stuff, extra blankets, movies, games, books etc.). The place was very well kept and the lay out and design is very tasteful in my opinion. We stayed for 3 nights and always had something to do each day. The view is amazing and each morning I would get up and go for a run to make the most of it. The owner provided a binder of helpful information around town which came very handy during our stay. It's definitely worth it for the price we paid and will be recommending Wraight Escape to friends and family! Thank you for an amazing stay. We had a wonderful time at your beautiful cottage. Thank you for providing all the essentials for us to have a wonderful weekend! Water was warm, property is Beautiful. We had a great time. Hope we can stay here in the future! Thank you for the warm welcome. we enjoyed the stay and felt more like at home. The kids had lots of fun with the movies and books collection. We appreciate the way the things have been organized around. Will probably use a tip or two which we learned from here in organizing things around. The boat rides (canoe and kayak) were really fun. The BBQ place was awesome. Welcome wine was great. A small feedback related to outdoors were the bugs being a spoil sport. Maybe a bug spray or two would have helped. We did buy them the next day. 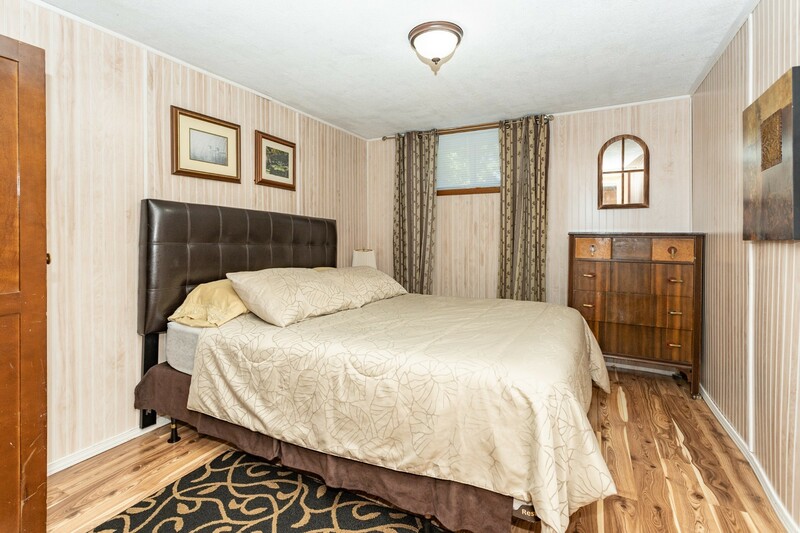 All bedrooms have comfortable new mattresses and come with high thread count sheets. 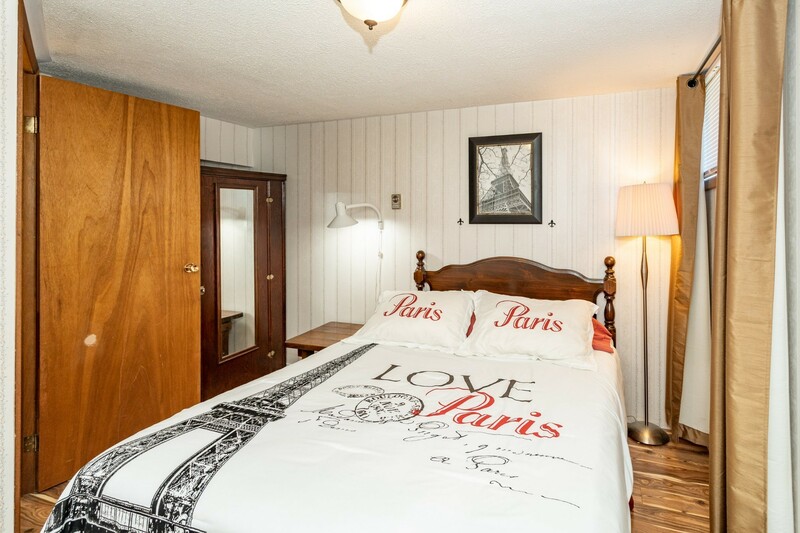 There are 5 bedrooms in total. 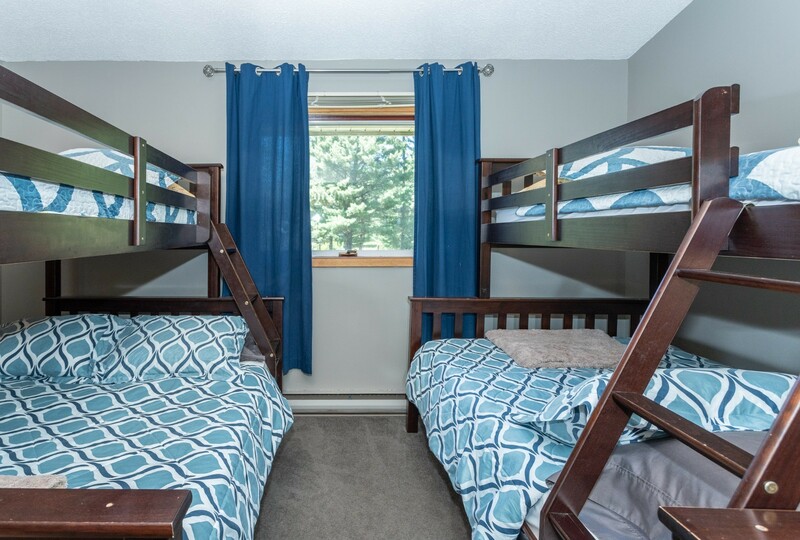 Two on the main floor have Queen beds, and the third bedroom has two bunk beds, perfect for kids - single over double beds. 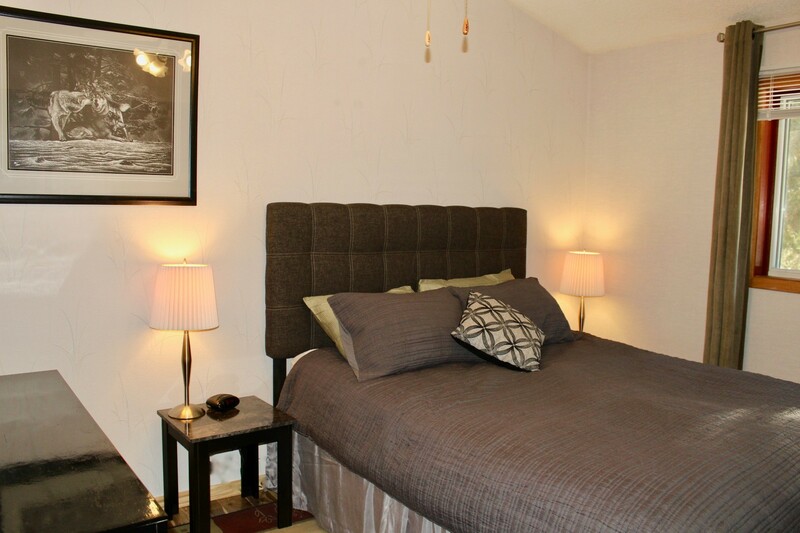 The two bedrooms on the lower level have Queen beds with gel foam mattresses. All linens, towels, and pillows are provided and are freshly washed for your arrival! 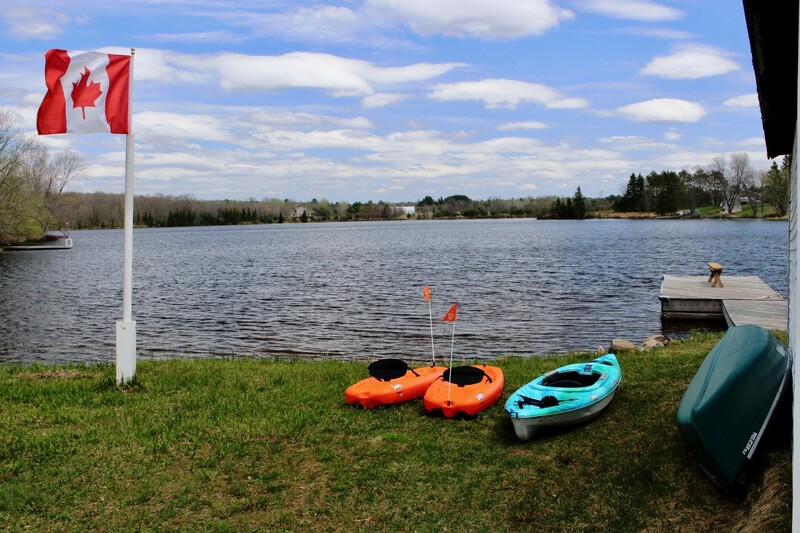 Visit Manitouwabing Lake Community Association for area activities! Fully equipped Kitchen just like home and one high chair, Dining Table, Large Family Room, Screened Muskoka room on back deck, 5 Bedrooms, 2 Bathrooms, Propane fireplace, Pool Table, Darts, Foosball, Wii system and games, 55" & 40” TV’s, PVR Bell box upstairs, Internet, Gated Deck across back of cottage with a South East view of the lake. Parking: 4 Vehicles. Upon request a locked double car garage to keep your ATV, Sea-Doo, or snowmobiles safe. 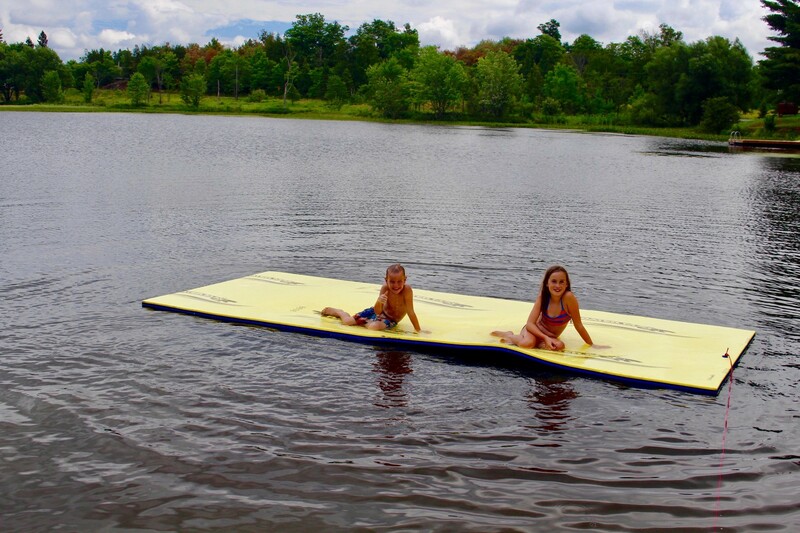 Floating Water Mat, 14’ Aluminium Rowboat with Oars, 15’ Canoe with Paddles, Family Pedal Boat, two adult Kayaks, two children’s Kayaks, 6 adult and 6 child Life Jackets (various sizes), Dock with ladder, Fire Pit, Volleyball Net and Outdoor games, Muskoka Chairs. Public boat launch and worms 2 mins away at Tait's Landing. Keurig Machine, Coffee Maker, Kettle, Water Cooler, Microwave, Toaster, Slow Cooker, Veggie Steamer, Dishwasher, Refrigerator with Freezer, Oven, Stove, Propane BBQ, Washer, Dryer, fully stocked just like home with dishes, cutlery, pots and pans, baking trays, serving dishes, salad spinner. 2 Televisions - 55” upstairs & 40” downstairs, Bell Satellite Dish, DVD Player, DVD & CD Collection, Board Games, Books, Magazines and Internet. Pool Table with Boston and Snooker Balls, Darts, Wii system with games, Foosball table .